KATHMANDU, Dec 25: In the last fiscal year 2016/17, the government spent Rs 204 billion in capital expenditure injected in infrastructure projects, purchasing machinery and equipment for capital formation. 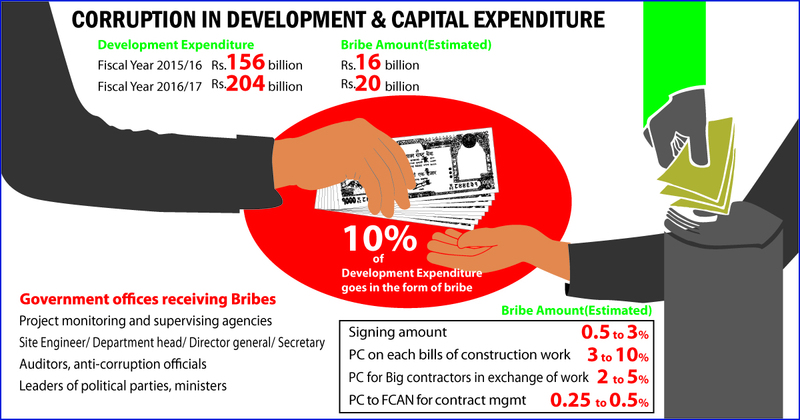 But a large portion or minimum 10 percent or about Rs 20 billion of the amount went into paying bribes in the form of commissions -- to civil servants, engineers, department heads, secretaries and ministers, according to Republica's interviews with a dozen government engineers and civil contractors. All of them spoke on condition of anonymity. This commissions, also called 'PC' (short for percentage), also goes to government auditors to anti-graft bodies, political party leaders and party offices. The under-the-table dealings of 'PC' increase rapidly after March when spending takes momentum and continues until the last day of the fiscal year. An estimated Rs 16 billion (10 percent of Rs 156 billion spent in capital expenditure) in fiscal year 2015/16 went into paying PC. This form of corruption was at negligible level until a decade ago. Many officials and contractors interviewed see the give and take of PC as the new normal. Talking to Repubica, an 'A' class contractor said, "A contractor has no option but to pay 10 percent just to remain in business." If a contract is highly competitive then contractors pay less in bribes - around 6 percent. This PC, as per Republica's calculations, 5.57 percent is the lowest but can go up to 25 to 30 percent in the development works or procurements implemented by Consumer Committees or institutions (mostly owned by political parties and directly awarded procurements of up to Rs 10 million). An engineer at the Ministry of Irrigation (MoI) said, "Civil servants think that PC is their right while contractors see it as a liability and as a result, the quality of the public sector work is heavily compromised." An engineer at the Ministry of Physical Infrastructure and Transport (MoPIT) however said, "Not all engineers claim such commissions but the give and take is customary." Former president of the Federation of Contractors' Association Nepal Yakshya Dhwaj Karki said, "PC is an open secret and it is practiced in almost all public procurements. In the construction sector, working without paying PC is unimaginable as we cannot satisfy the government engineers with our performance alone." Contractors do not receive final payment for their work until the monitoring government engineers sanction the work after field visit. MoPIT spokesperson Rajendra Raj Sharma said, "The commissions are not reflected in paperwork so we cannot say anything about it." The PC is received on the same day or within a few days of the signing of the contract as 'signing amount'. Department heads themselves receive between 0.5 percent and 3 percent of the contract amount either at the office or at mutually agreed upon secret locations. Contractors pay this bribe from the mobilization amount (up to 15 percent of the total contract amount is paid to the contractor during the signing of the contract) meant for starting construction work. The 'signing amount' [commission] however varies depending on the nature of the work and the government departments involved. River embankment work under the Ministry of Irrigation fetches up to 5 percent as PC and it is between 2 and 3 percent in case of small and medium scale irrigation projects. But in big contracts, PCs are set at 1 percent or less because even 1 percent in such contracts are huge amounts. "In some cases, contractors have to cough up more money to project managers, site engineers and even ministers as additional commissions," revealed the MoI engineer who started his career in early 1990s. The PC ranges between 0.5 and 1 percent in building construction contracts. This means contractors have to pay up to Rs 5 million as 'signing amount' for a contract of Rs 500 million. This signing amount is set at the larger range -- from 0.5 to 2 percent-- for contracts of road and bridges, according to contractors and government engineers. "If the procurement official has favored the contractor to win the contract, the signing commission jumps up to 3 percent," claimed an 'A' class contractor. This means engineers of roads and bridges receive between Rs 2.5 million and Rs 15 million from a contract worth Rs 500 million. "There is no strict rule of signing amounts in our projects," claimed a divisional engineer at the Department of Roads. "However, sometimes government engineers are also hired by the contractors to work for them and they receive remunerations for their work on top of the commissions," added the divisional engineer. PCs, which weaken the contract administration, do not end here. The engineers or department heads concerned collect PC from each invoice the contractors submit to claim payment. The PC per invoice is set between 5 and 8 percent in river embankment works. Contractors also pay higher amounts in PC because by doing so they can compromise the quality and quantity of the work. "There is no fixed rate for PC on invoices but in irrigation projects under the Department of Irrigation, PC is paid in the range of 2-5 percent for big contracts (of above Rs 500 million) and in the range of 5-10 percent for smaller contracts," claimed an 'A' class contractor. This statement was supported by a government engineer. The contractor further said, "Engineers at the Department of Irrigation are merciless as they give us two choices - pay nothing or pay 10 percent." Pay nothing means the contractor has to pay huge bribes to the engineers, who monitor the project. PC per invoice in big building construction work is up to 3 percent and in small contract, the rate can go up to 10 percent, a contractor said. These commissions are shared by an entire system ranging from the junior staffers to officers to ministers. "Those unable to satisfy ministers and politicians are immediately transferred from the job," said an engineer at the Department of Urban Development and Building Construction (DUDBC) adding that commissions are hidden factors behind frequent transfers of project managers. Another government engineer revealed that normally 60 percent of the PC is distributed among department staffers and 40 percent goes to the ministers or political parties. Political parties also collect PCs from the ministers concerned while the opposition parties have their designated cadres (sector-wise like, buildings, roads etc.) for collecting such commissions, claimed both government officials and contractors. "Top brass of the political parties themselves collect commissions if the contract is big, worth billions of rupees," claimed a political party leader of CPN UML seeking not to be named. Even journalists receive a share of the PCs. "The department heads also set aside a certain amount for distribution among select journalists during Dashain and Tihar festivals to stop them from writing critical news stories," said a retired government engineer. "The rate of PC also depends upon ministers. In my experience of over 20 years, I knew only two ministers who did not care about PCs," said the engineer at the Ministry of Irrigation. "Sluggish or delayed construction work and poor development spending are the results of these dirty networks. At the same time, the contractors mobilize the money in other profitable businesses," explained the engineer. This PC hovers above 15 percent in the contracts won without competition or close to the estimated amount of the project, according to contractors and the government officials. Contractors said the gangsters and ringleaders also get their shares - around 2 percent paid separately by contractors. Despite Police warning, contractors are still paying them in the same way they used to in the past for winning contract before the electronic bidding system was introduced. These PCs from public procurements are one of big sources that fuel the underground economy. Former vice-chairman of National Planning Commission Yuba Raj Khatiwada did not comment on the 10 percent PCs but stressed on legal reforms. Budget transfers are done when the budget allocated is insufficient to pay the contractor. These transfers need to be sanctioned by the Ministry of Finance itself and the process can take weeks or months. Such delays cause losses to the contractors in the form of interest on bank loans. "So to get things done quickly, we prefer to pay some amount in PCs instead of suffering losses, said an 'A' class civil contractor mainly of road and building. A separate PC is collected for sanctioning cost overruns, which happen in many cases. "Except for a few genuine cases of cost variations/overruns, most are made up to pocket commissions," added the FCAN member. Payment controversy over Rs 1.09 billion cost overrun assigned to tunnel squeezing in Chameliya Hydropower Project is one of the latest examples. Internal auditors of the Treasury Controller Office seek up to 0.2 percent commission for auditing each invoice related to development projects or procurements. This is Rs 20,000 per invoice worth Rs 10 million. Likewise, the auditors at the Office of the Auditor General demand another 0.2 percent commission. An auditor at the OAG revealed that about 60 OAG auditors receive PCs and this is supported by the trade union at the OAG. On top of this PC, department heads and project managers have to spend a good amount of money on food to please these auditors," said irrigation engineer. Both government engineers and contractors also allege that officials at the Commission for the Investigation of Abuse of Authority (also known as 'red house' amongst them) also work as a witness in deeply rooted institutional corruption. "CIAA grills the department heads and sits on those files for a few weeks or months and later the investigation is dropped," said a recently retired government official. "For example, Former Minister for Physical Infrastructure and Transport Bimalendra Nidhi arranged a setting in contracts of the railway project of 29 km eastward from Bardibas to award the contract at his will, the 'red house' sprang into investigation, collected files and grilled civil servants and later the file was returned without any action. The silence in such an obvious case is questionable," revealed the retired official.